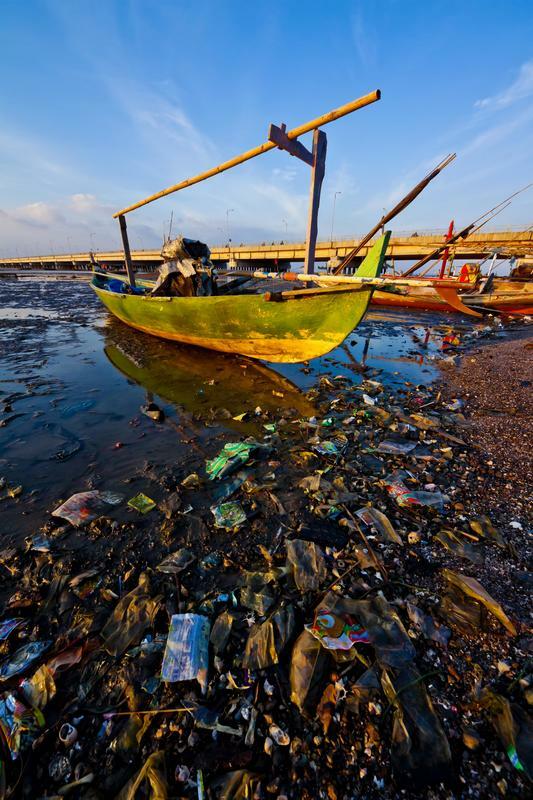 Plastic marine debris is increasingly recognized as a global problem that requires urgent solution. Plastic debris is unsightly, hazardous to marine species as well as mariners, and has negative effects on the economy. The main solutions lie in reusing and recycling plastics and ensuring proper disposal of the remaining plastics. Globally, over 280 million tonnes of plastic are produced annually. A key benefit of plastics is their durability, yet around one third of production is of disposable packaging, discarded within a year of production. As a result, plastic debris are accumulating in the environment as well as in regulated landfills (1). In the marine environment, 75% of all debris is plastic, contaminating habitats from the polar regions to the equator and from shorelines to the deep sea (2). The distribution of debris is not uniform, and it can be transported to locations far from population centres (3). This debris can persist for decades, but patterns of abundance over time are far from clear; some studies show an increase while others show no clear trend. It has been suggested that there may be unrecognised “sinks” where considerable quantities of plastic are accumulating (2). Plastic debris is unsightly, has negative effects on the economy, and can present a hazard to mariners (4). Considerable expense is therefore invested in removing debris form ports and shorelines (5). Encounters between marine debris and marine species have been reported for over 660 species; 80% of these encounters are with plastic debris. Physical harm to individuals includes entanglement, leading to lacerations and mortality. For species like the northern fulmar, the majority of some populations (>95% of individuals examined) have plastic in their digestive tract (6). There is no evidence of population level consequences; it is very difficult, however, to link population level changes to single causative agents, and a lack of evidence does not necessarily imply a lack of effect. In addition to physical effects, there are concerns that ingestion of plastic debris could lead to toxicological harm either because they accumulate persistent contaminants from sea water, or because they release chemicals incorporated during manufacture (such as plasticisers, flame retardants, and antimicrobials). Polyethylene and other plastics absorb persistent organic pollutants form seawater, and these can become orders of magnitude more concentrated than in the surrounding water (7). These chemicals can then be released in the gut, where desorption is facilitated by surfactants (8). Mathematical modelling indicates that the role of plastics in the transport of contaminates to organism may be relatively small compared to other pathways (9, 10); however, simple modelling approaches may be inaccurate because a range of factors such as pH and temperature will influence the equilibrium of chemicals between seawater, plastic and the tissues in an organism. For example, a warm blooded animal would have a greater potential to receive contaminants from plastic than a cold blooded organism. Further work to establish the relative importance of plastics as a vector under differing environmental and physiological conditions and in relation to uptake via other pathways including feeding and respiration is required to more fully understand the potential for plastics to transport chemicals to organisms. With respect to the impacts of plastic in the environment, there are three important additional considerations. First, about 8% of world oil production is used to make plastic items, yet around a third of these items are discarded within a short time frame. Recycling end-of-life plastic can reduce the accumulation of debris while at the same time reducing the demand for fossil carbon (4). Secondly, the benefits from plastic items can be obtained without end-of-life plastics accumulating as debris in the oceans. Thirdly, discussions with other scientists, representatives from industry, policy makers and NGOs have shown that while there may be discussion and sometimes disagreement about the relative importance of the various impacts, there is typically universal consensus to reduce inputs of debris to the ocean. Energy recovery via incineration for items that cannot easily be re-used or recycled should be a last resort. This hierarchy of options should be considered for every plastic product at the design stage to reduce both the use of fossil carbon and the accumulation of waste. Such principles are gaining momentum, for example, in the EU. Public interest can also lead to response from industry; some UK supermarkets have voluntarily opted to reduce use of single-use bags. However, some actions, if used inappropriately, could work against these goals. For example, use of bio-based carbon from agriculture is seen as a sustainable alternative to fossil carbon, but altering the carbon source does not reduce marine debris. Similarly, designing plastic products to degrade or disintegrate more rapidly can compromise the potential for product re-use, contaminate recycling, and lead to rapid accumulation of fragments in the environment (4). Policy-led coordination, supported by sound science, is needed to use the above measures for achieving change through a range of measures, including voluntary actions, incentives, taxes, and education (1). In particular there is a need to re-educate: during my life time, production of disposable short term products and packaging has rapidly increased, as has that of durable goods that cannot be repaired or renewed. In a growing culture of throw-away living, there is an urgent need to recognise there is no such place as “away”. This article is based on the author’s 2014 ECG Distinguished Guest Lecture and on his contribution to ‘The challenge: Plastics in the marine environment’ in Environmental Toxicology and Chemistry, 33, 5-10, (2014). 1.STAP, Marine Debris as a Global Environmental Problem: Introducing a Solutions-Based Framework Focused on Plastic, In A STAP Information Document, Global Environment Facility, Washington, DC, 2011, p 40. 2.D. K. A. Barnes et al., Accumulation and fragmentation of plastic debris in global environments, Philosophical Transactions of the Royal Society B, 2009, 364, 1985-1998. 3.K. L. Law et al., Plastic accumulation in the North Atlantic subtropical gyre, Science, 2010, 329, 1185-1188. 4.R. C. Thompson, et al., Plastics, the environment and human health: current consensus and future trends, Philosophical Transactions of the Royal Society B, 2009, 364, 2153-2166. 5T. Mouat, R. Lopez-Lozano, H. Bateson, Economic Impacts of Marine Litter, 2010, KIMO (Kommunenes Internasjonale Miljøorganisasjon), p. 117. 6.J. A. van Franeker et al., Monitoring plastic ingestion by the northern fulmar Fulmarus glacialis in the North Sea, Environmental Pollution, 2011, 159, 2609-2615. 7.Y. Mato et al., Plastic resin pellets as a transport medium for toxic chemicals in the marine environment, Environmental Science & Technology, 2001, 35, 318-324. 8.E. L. Teuten et al., Potential for plastics to transport hydrophobic contaminants, Environmental Science and Technology, 2007, 41, 7759-7764. 9.T. Gouin et al., A thermodynamic approach for assessing the environmental exposure of chemicals absorbed to microplastic, Environmental Science & Technology, 2011, 45, 1466-1472. 10.A. A. Koelmans et al., Plastic as a carrier of POPs to aquatic organisms: a model analysis, Environmental Science and Technology, 2013, 47, 7812-7820.